East Coast earthquake occurred on 2011. The 5.8 magnitude earthquake was centered in Louisa County, Virginia, but its effects were felt as far north as Quebec and as far south as Atlanta, Georgia. Experts believe one-third of the country’s population experienced the earthquake. No lives were lost, but damages did occur. 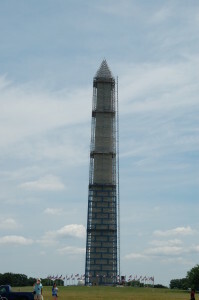 Washington, DC had significant damage, including the Washington Monument (now reopened) and the National Cathedral. Georgia became the fourth state in the United States by ratifying the Constitution in 1788. Although one of Georgia’s nicknames is “The Peach State,” the crops of peanuts and tobacco each bring in more revenue than peaches. Cotton, which was a very important source of revenue one hundred years ago, now generates a little more than one percent of the state’s income. Atlanta is the state capital. Children can visit an Internet site at: Georgia. Idea: Children could make and enjoy a simple peach cobbler. 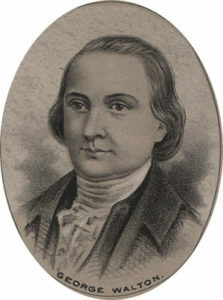 George Walton died in Augusta, Georgia, on February 2, 1804. He was born near Farmville, Virginia, 1741, but his exact birth date is unknown. Representing Georgia, he signed the Declaration of Independence. He fought for his state militia during the Revolutionary War and was caught by the British in late 1778. He was imprisoned until September 1779, when he was exchanged for a British officer. After the war, he served as Georgia’s governor, a United States senator, and the chief justice of Georgia’s highest court. The Cherokee Phoenix, published on a weekly basis in Georgia, became in 1828 the first Native American newspaper. It stopped publication in 1834, but today an electronic version is still being published. John Stith Pemberton sold Coca-Cola for the first time in 1886 in Jacob’s Pharmacy in Atlanta, Georgia. He sold nine glasses at a nickel each. Children could learn more at: http://www.coca-colacompany.com/topics/heritage. The steamship Savannah departed this day in 1819 from Savannah, Georgia. When it arrived in Liverpool, England, on June 20, it was the first steamship to successfully cross the Atlantic Ocean. Georgia celebrates Independence Day. The country declared its freedom from Russia on this day in 1918. However, in 1921 the Soviet Union conquered Georgia. On April 9, 1991, it broke away from the Soviet Union. Located on the eastern coast of the Black Sea and possessing a Mediterranean climate, Georgia, according to the CIA World Factbook, is about the size of South Carolina. About 4.6 million people live in Georgia. Industries include steel, machines and tools, and timber products. Tbilisi is the capital.